Remember this recipe, the smoothie with the peaches & the spinach? Yuppers, this is what we usually do. It’s easier and faster in the mornings to just throw in spinach and frozen peaches, instead of having to take the time to cut them up. It works beautifully! We found a nice, simple way to do this from Better Homes & Gardens. Steps & Pictures 1-6 belong to BH & G. The seventh step is changed to how we normally do it. Use a sharp knife to make a shallow X on the bottom of each peach. Bring a large pot of water to boiling. Working in batches, carefully lower 3 or 4 peaches into the boiling water for 30 to 60 seconds. Using a slotted spoon, transfer peaches from boiling water to the bowl of ice water. When the peaches are cool enough to handle, use a knife or your fingers to peel the skin from each peach. They should be super easy to peel though. You should barely have to use a knife. Using a sharp knife, cut each peeled peach in half around the pit. Gently twist each half to expose the pit. Using the knife, pry the pit out of the peach. 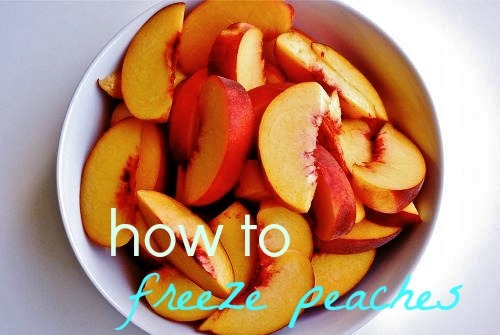 Cut each peach half into slices. 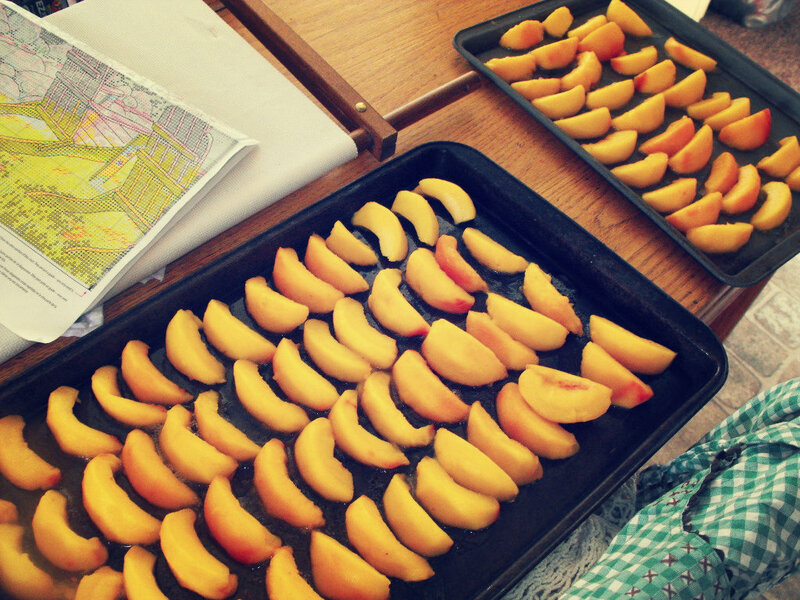 Arrange peach slices evenly on baking sheets, and make sure they’re not touching each other (unless you want a big ice-ball of peaches). No Place to Hide by Dr. W. Lee Warren, M.D. “When Dr. W. Lee Warren landed at the 332nd Air Force Theater Hospital at Joint Base Balad, Iraq, he quickly learned that the challenges he faced as a brain surgeon in Texas were nothing compared to tent-hospital operations in a war zone. Dr. Warren faced trials that most individuals couldn’t live through. A rocky marriage at home. Thinning relationships with his kids. Mortars crashing near his living quarters. Not knowing if he would be alive by the end of the day. And his faith on life-support. This book was not an easy read. Right and wrong were not black and white. He phenomenally displayed the grey areas, and he showed war for what it really is: gritty, dark, and something no one can understand unless he’s lived in it. Most military books written in the first person are from the perspective of soldiers and those in combat. But No Place to Hide tells the horrors and fears a brain-surgeon had to face every day for four months. Dr. Warren accounted his feelings and thoughts throughout his time in Balad. He reveals to us his fears in a very real, very powerful way, not only of rockets and bombs and terrorists, but also on a spiritual level. A book everyone should read. It gave me a new perspective on my day-to-day life — while I’m complaining about current politics and the news, there are people fighting for our country right now, dodging missiles and watching their comrades die, and, later, going in for PTSD therapy. Or not coming home at all. A reminder not only of the frailty of life, but also how we have no control over it. God has planned everything, and even when things seem too chaotic and the world is spinning out of control … we as Christians have the hope that this world is not made from a random explosion. God has — and always will have — control over the most wildest, darkest parts of our lives. I received this book free from the publisher through the BookLook Bloggers <http://booklookbloggers.com> book review bloggers program. I was not required to write a positive review. The opinions I have expressed are my own. Just made this a few days ago. I know, this isn’t my picture. It’s Pioneer Woman’s picture. But let’s just say it was pretty much inhaled before I could take a picture of it. Mix together the sugar, oil and eggs in a large bowl. In another bowl sift together flour, salt, baking powder, baking soda and cinnamon. Add to first mixture and combine. Then add carrots and mix well. Pour into a greased and floured (Baker’s Joyed) pan (bundt, sheet cake, 9 x 13 pyrex) and bake at 350F until done, 25 (sheet cake) to 50 (Bundt pan) minutes, depending on the pan you use. In larger bowl, cream butter and cream cheese. Add sugar and vanilla and blend, then mix in the nuts. Spread on cooled carrot cake. Eat. Faint. Repeat as needed. “By design, women were created to be relational creatures. We long for intimacy. We long to be loved, to be fully known, and fully accepted for who we are. We want to possess inviting aromas; aromas that welcome people to get to know our hearts and have meaningful relationships with us. We have a desire to be desired. Does any of this sound familiar? It should. Our wiring is a direct reflection of the heart of Jesus, and His overwhelming desire for intimate relationships with us. We’ve been created to reflect the gentle, welcoming, alluring, nurturing, captivating, and compassionate components of the heart of Jesus. Just as much as we long to captivate, we long to be captivated. This is how we as women have been made in His image. God longs for us to desire Him. He longs to be fully loved with everything we’ve got, and longs for us to seek the intimacy we desire through relationship with him. However, we often find ourselves struggling to truly seek out these intimate relationships with Jesus, and it’s far too easy for distance to come between us and our Heavenly Father. Here are some of the factors that distract us away from finding intimacy with Christ, and how we can draw near to Him again. 1. We feel we have to “hide” from God. Whenever we sin and fall short of God’s glory time after time again, the levels of guilt and shame we feel can make us feel we have to hide. We know that we went against what our Father instructed, and therefore feel we no longer deserve to be close to God. Not only do we feel undeserving, but it is hard being close to someone we went against. There’s a reason why sin separates. Imagine how challenging it would be to be intimate with a spouse if you’ve been hiding mistakes you made from him out of fears you don’t deserve his forgiveness, or out of fearing the potential wrath? Even when Adam and Eve committed the very first sin of humanity, their first reaction was to hide from God. Genesis 3. It’s hard to be intimate with someone we’re hiding from. However, when we mess up, God doesn’t want us to hide. He wants us to repent. Hiding distances and distracts us from intimacy, while repentance draws us back. Acts 3:19 says “Repent, then, and turn to God, so that your sins may be wiped out, that times of refreshing may come from the Lord.” Once we repent, we come to realize that our God is not a God holding a lightning bolt waiting to strike us when we sin. Instead, He wants us to confess so nothing stands between us, and He ALWAYS chooses to forgive us freely and to love us unconditionally. 2. We get busy with life. It’s so easy to become caught up in the business of life. Especially this time of year in December with all of the Christmas shopping, holiday preparations, and final exams for college students on top of everything else we prioritize in life. In the same way we feel a void or a sense of aching when our loved ones become too busy to make time for us, Christ’s heart aches when we become too busy to make time for Him. When we become so consumed in paying the bills, meeting the deadlines, finishing the shopping, we begin to feel that same void and aching in our hearts. How hurt would you feel if your husband or dear friend whom you deeply loved never made time for you? How could that in any way strengthen an intimate relationship? An intimate relationship with Jesus takes investment, prioritizing, and discipline. If that means waking up a half hour earlier than usual in the mornings to set aside a quiet time of prayer/devotion to draw near to the Father, then I strongly encourage that. The only thing that can truly fulfill our desire to be desired is Jesus, and it’s crucial we set aside time to strengthen and build our relationship with Him. 3. We seek out the wrong forms of intimacy. As women in the twenty-first century society, so much emphasis on our value is placed on how highly men desire us – which is dangerous when we long to be desired. We’re taught that if we can seduce men, we’ll be accepted and desired, which is what our hearts long after. 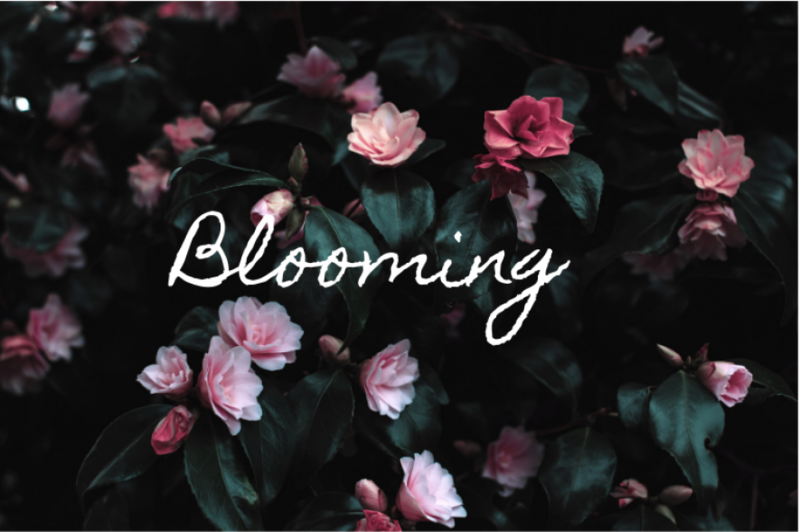 For single women, this can look like devoting all our time and energy into trying to seek the attention of men, which can often lead to compromising our values, ultimately distracting us from our relationships with Christ. Remember, sin separates. It’s alarming how quickly our focus can be shifted away from pursuing our fulfilling relationships with Christ to shifting towards society’s distractions. Being pushed into the rapid current of dressing less to impress, and compromising our values in order to be desired by fulfilling desires of the kind of men who objectify women. For those of us who aren’t yet married but have significant others, we need to guard our hearts from feeling we have to be seductive in order to be captivating girlfriends. Our true identity is found in Christ alone – not the eyes of men. Our identity in the Father says we’re beautiful the way we’ve been created. We don’t need to seek society accepting us as beautiful if the Lord of the Universe says we already have beauty just the way we are. 4. We place marriage relationships above our relationship with Christ. There is absolutely nothing wrong at all with having fully physical, mental, and emotional intimacy with your husband. In fact, God encourages and wants us to have that within the perimeters of marriage. Becoming one with your husband and creating powerful intimacy is how marriage reflects characteristics of God’s love by symbolizing the body of Christ being yoked together as one. However, even when committing to spend the rest of your life to being a devoted wife to your husband, it’s important to remember the relationship with Christ should still be the first priority. Even over your husband. We can easily be so caught up in the excitement of having a husband to have that desired intimate relationship with, we begin to neglect our relationship with Jesus by devoting all of our undivided efforts to our husband alone, placing him above our relationship with Christ. Then, the void in our hearts returns. Even within marriage, Christ is the only thing that can give us ultimate fulfillment and ultimate intimacy. Also, the best way to give your husband meaningful, abounding love is by loving the Father first. Learning to Love Jesus first and your husband second is a win win! * yes, this is a repost.